Pakistan has blocked 800 web pages and URLs to limit access to "blasphemous" material, extending a crackdown that has already banned access to Facebook and YouTube, an official said Saturday. 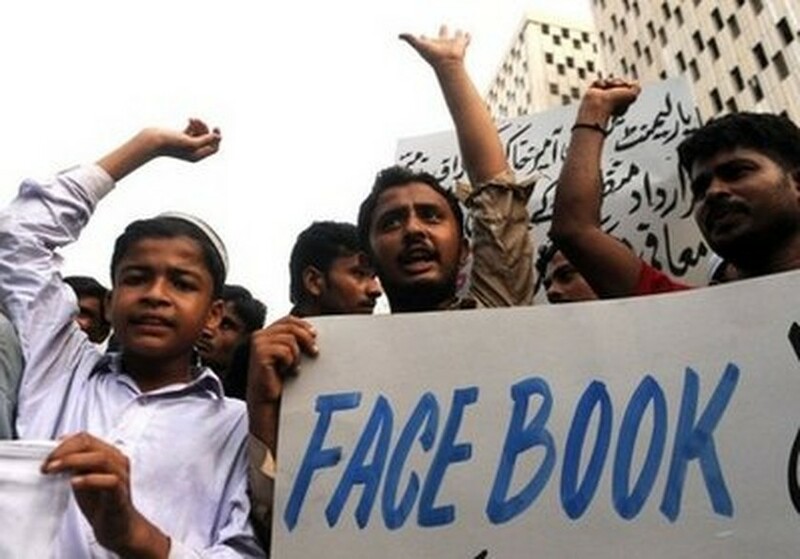 Pakistani Islamists shout slogans during a protest against Face Book in Karachi on May 21. The Pakistan Telecommunications Authority (PTA) banned access to Facebook, YouTube and other links, which included restricted access to Wikipedia, in view of what it called "growing sacrilegious content" this week. "At least 800 individual web pages and URLs have been blocked since the government's orders to shut Facebook and YouTube," Wahaj us Siraj, a spokesman for the Internet Service Providers Association of Pakistan told AFP. Siraj's remarks came hours after the Facebook user who organised an "Everyone Draw Mohammed Day" competition to promote "freedom of expression" evidently took down the page along with a separate blog about the campaign. The competition sparked angry protests in Pakistan, a conservative Muslim country of 170 million, although members of a well-educated, moderate elite expressed disappointment on the blanket ban on the wildly popular websites. Islam strictly prohibits the depiction of any prophet as blasphemous and Muslims all over the world staged angry protests over the publication of satirical cartoons of the Prophet Mohammed in European newspapers in 2006. Siraj said that any decision to restore Facebook and YouTube access would be taken by the PTA. The offending Facebook page attracted 105,000 fans -- and five pages of crude manipulated pictures and caricatures. Pages denouncing the competition and calling for a boycott of the May 20 competition attracted far more fans. PTA spokesman Khurram Mehran told AFP on Saturday that the authority would lift the ban only after receiving instructions from the government. "We are just an implementing authority and we have to act on the orders from the government," Mehran said. Pakistan also briefly banned YouTube in February 2008 in a similar protest against "blasphemous" cartoons of the Prophet Mohammed.